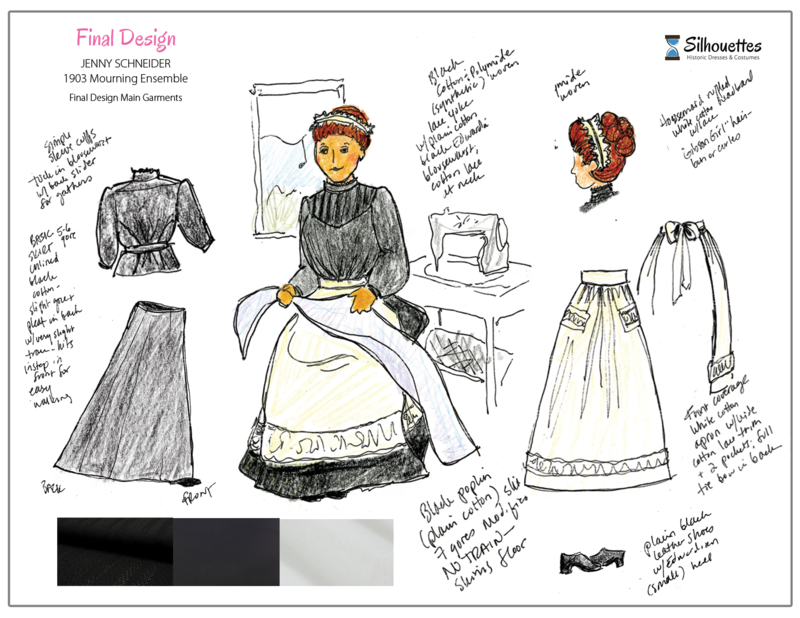 The outward expression of Victorian status was most easily seen by hiring domestic servants. She needed maids to help her dress and maintain a home full of items on display. The biggest employer of women from the late 1870’s to WWI was domestics. Women usually worked as maids only until marriage, but African Americans and Irish Catholic women, working predominantly in the north and east, kept working while married. Small towns were being overtaken by the building of factories, and with the railroads and improved roadway systems in Europe and the US, women could travel to places to seek employment. Wealthy industrialists built estates near their factories, and around them villas for their managers and housing for employees. It made an ideal situation for young women to work in the estate house. The immigration of young unmarried Swedish women for this purpose was at its peak in the 1890’s. Crop failures and the lure of friends who had already come to America in the 1840’s called them to go directly to towns and cities in search of maid positions. 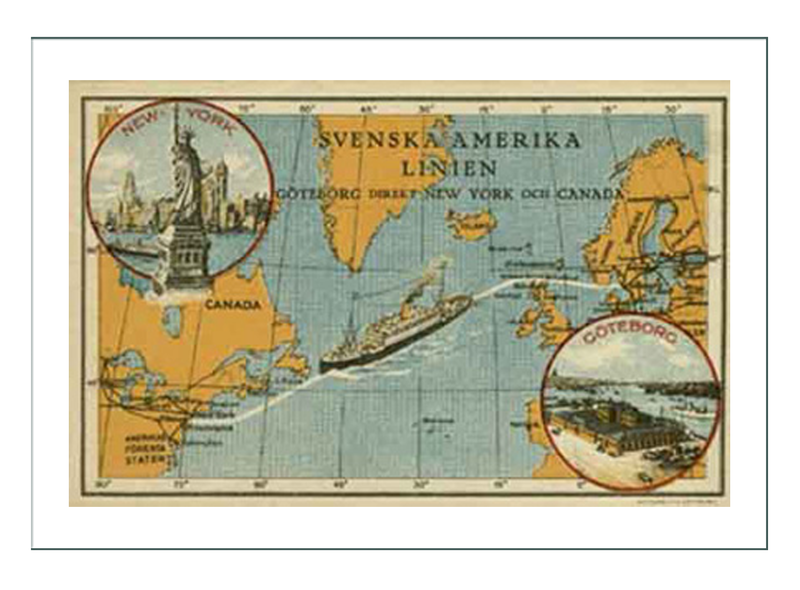 Swedish immigration to the US peaked in the 1890’s due to the low cost of crossing the ocean and the call of the pioneer in search of a better life. Many of the young women had been farm peasants pushed out due to crop failures, and the Homestead Act of 1862 brought them to free land. In a type of “chain reaction” which brought Swedes on the tail of other Swedes before them, most Swedes became pioneers right away. They went directly to the Midwest, and then made the jump establishing Swedish settlements in Nebraska and Kansas where they were able to farm the prairie better than most due to “dry farming” methods learned in Sweden. These women were highly desired because they were enthusiastic and learned the language and customs quickly. 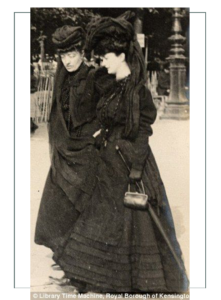 They gained the sophistication Victorian women needed, and earned a place as a part of the family. Much is written about the virtues of Swedish domestics stating they had “American Ladylike Manners”. They established a new standard of what the woman of the 21st century would be – elegant, sophisticated, hardworking, enterprising, and enthusiastic. Tt is not surprising western ranchers seeking a companion or assistant for a wife would go to the cattle centers like Chicago to find a young Swedish woman. 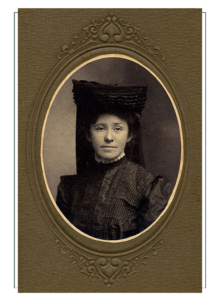 As an honorary member of the family, a maid would be required to follow the same social customs, although from a different pew in church, or riding in a different railroad car than her employer. 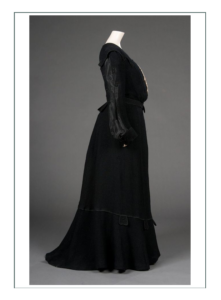 Clothing was the outward display of status, so a maid would be provided with correct ensembles for the situation. The young women came from Sweden specifically to become domestics, and directly to families and settlements in the Midwest. Nebraska being a key destination, it was only a quick move to work on a ranch in the next state to the west. In developing Wyoming characters, we had been looking for the movement of Swedes in the 1890’s. The town of Gillette was founded in 1892, and was a mining and coal town. 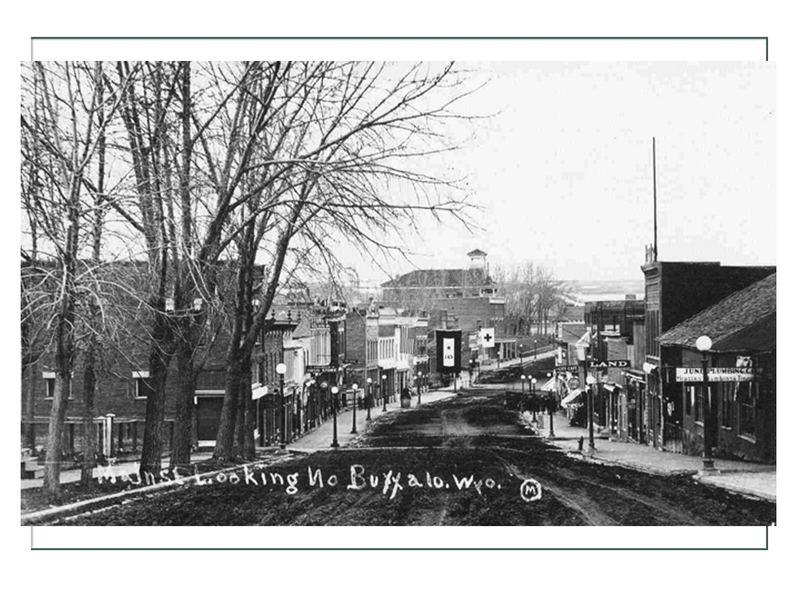 Buffalo, Wyoming at the base of the Big Horn Mountains, had lovely Victorian mansions and wealthy people at the time who might have employed servants. Red Lodge, Montana on the other side of the mountain had a similar history. It was, however, a story in wyoming.org history that intrigued us in seeking out “a home” for our character. Following is from their website. 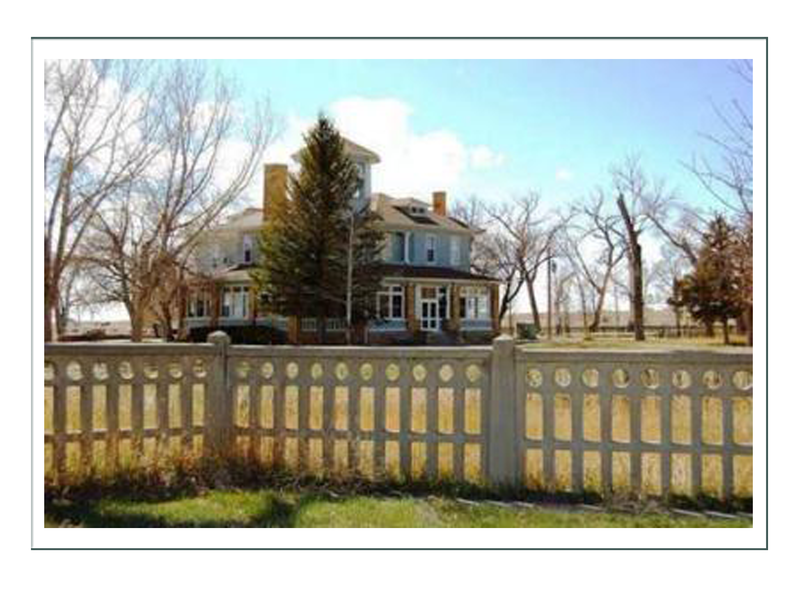 We believe this is where Lynette would have made her new home at the turn of the century. Note that the wife of Mr. Okie was Swedish! This was an unexpected and happy accident of our research. 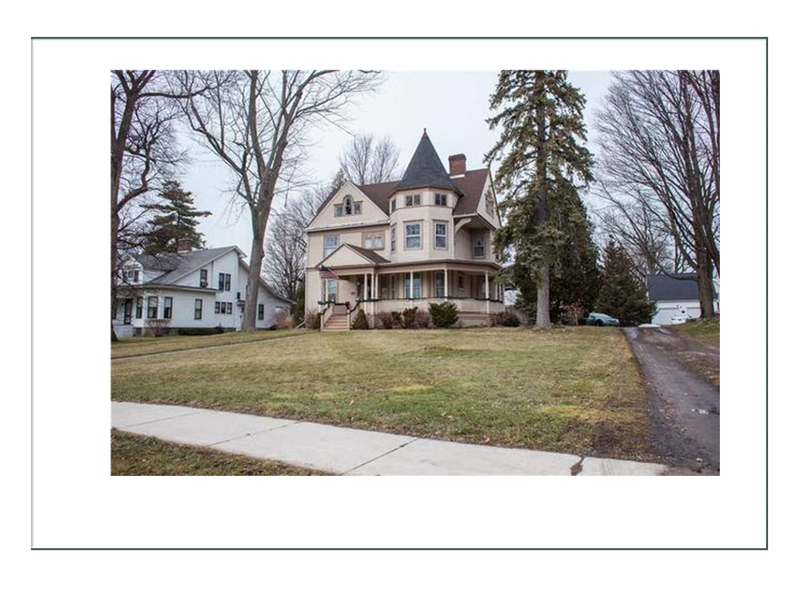 His home was built with the latest architectural design, indicating his desire for display of status, and it was completed in 1901 – also perfect to bring a new Swedish maid from friends in Nebraska. 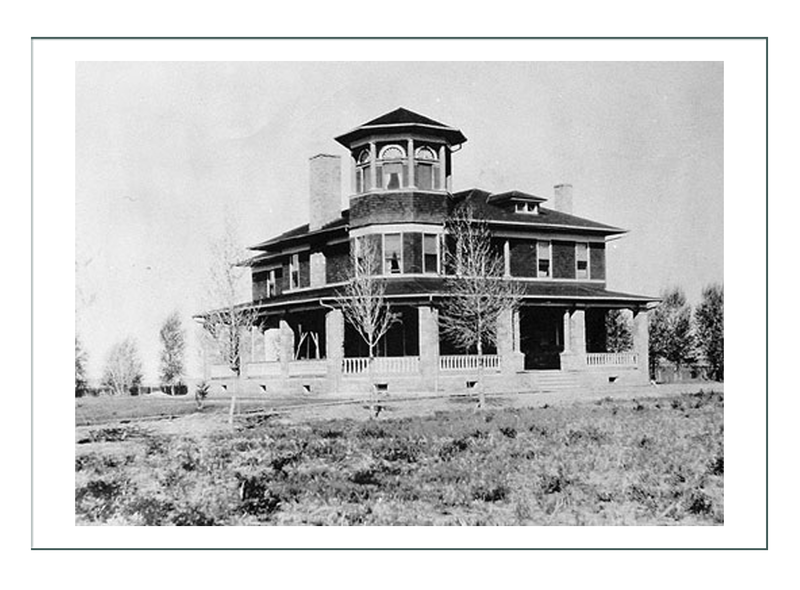 In the fenced yard of his mansion at Lost Cabin, Wyo., J.B. Okie built an aviary—a birdcage big as a house. Plants thrived inside, like a jungle. Among the greenery, cockatoos, macaws and birds of paradise flapped, shrieked, and hopped from perches to little swings, bobbing and looking for snacks. Children reared near Lost Cabin at the start of the 20th century would remember the aviary all their lives: Its wild sounds, strange smells and scary, bright-colored birds. And they remembered J.B. Okie. Decades after his death in 1930, people still told stories about J.B. Okie—his airstrip, his roller rink and dance floor for his employees, his parties, his cars, his mansion, his mechanized sheep-shearing sheds, his golf course, his aviary, his business methods and the women he married. Out of some mix of nervousness and respect the tale tellers asked that only the good things about him be remembered. But they also passed on stories about his flaws. John B. Okie was an excellent businessman. He was good at it because he had big ideas, and at the same time he was thorough and methodical about putting his ideas into action. He imagined the dry, sagebrush-covered hills of central Wyoming scattered with flock after flock of his sheep. He imagined a chain of stores to sell ranchers, cowboys, sheepmen and their families things they needed on terms they could afford. When he became wealthy, and after his wife bore their eight children, he imagined a new life with a younger, prettier, more glamorous wife—and he made that happen, too. John B. Okie was the son of a real-estate businesswoman and a well-to-do doctor in Washington, D.C. In 1882, when Okie was 17 years old, confident and ambitious, he headed west on his own. He rode the train to Rawlins, in Wyoming Territory, where he found a job as a cowboy for the summer. Then he traveled east again and talked his mother into lending him $4,500 to buy a herd of sheep. He returned to Wyoming. In November, he bought 1,000 ewes, 16 rams, two teams of horses and a wagon. The sheep belonged to his mother. They agreed to split the profits from selling each year’s crop of wool in the spring and lambs in the fall. The first winter, Okie herded the sheep beside Beaver Creek in Fremont County. Because he didn’t have much experience raising livestock, he made mistakes. He let the sheep graze too long in each place he kept them, ruining the grass and thereby weakening the animals. When a bad storm struck, nearly half his herd died. The next summer, he joined his sheep in with another man’s herd, and went to work for the man as a herder at $40 a month. In so doing, he learned better ways to tend his own herd. He sold some property he owned in Washington for $300 and bought more sheep. His mother still owned the rest, however. Soon, Okie moved his herd north to Badwater Creek. This stream flows west along the southern edge of the Bighorn Mountains in central Wyoming and joins the Wind River as it gathers in what’s now Boysen Reservoir, north of Shoshoni. The country Okie crossed with his flocks is very dry. Badwater Creek, with green cottonwoods and willows growing on its banks, must have seemed like an oasis in the summer dust. That fall, Okie’s brother Howard joined him. They spent the winter living in a tent. The next year they built a rough dugout. Howard left to seek other adventures, but Okie spent three more winters in the dugout. It was always a risky business. The severe winter of 1886-’87, which nearly destroyed the cattle business in much of Wyoming and Montana, killed three-quarters of Okie’s herd. But while cattle prices fell and kept falling, sheep prices continued to rise. On his 21st birthday, Okie’s mother had given him half interest in the sheep and cancelled the $4,500 debt. Her half interest meant that when the sheep were shorn each spring and the wool was sold, she still received half the money. About that same time, Okie decided to marry. 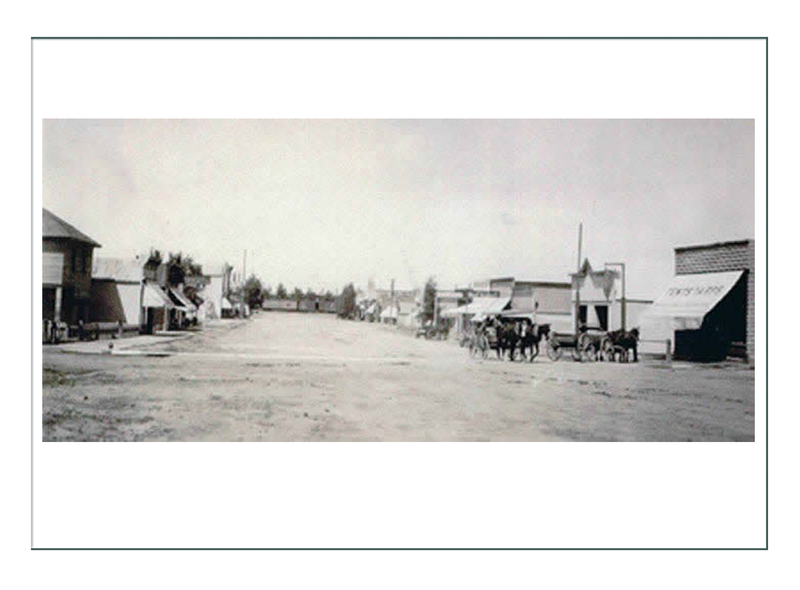 In the spring of 1887, on a trip to Rawlins, he met 20-year-old Jeannette Anderson, a young Swedish woman recently arrived in Wyoming with her parents. Okie and Jeannette corresponded over the summer, and married that fall. Jeannette worked hard on the ranch. She learned to shear sheep and tend to injured men when necessary. Okie, meanwhile, built a larger and more solid cabin on ground above Badwater Creek. Over the next 15 years, the couple had eight children; one died at the age of four. As the family increased, Okie added more rooms to the cabin. Meanwhile, Okie kept buying sheep and selling at a profit, and buying more and selling at a profit. By 1891, the Wyoming Derrick in Casper was calling him “sheep king,” and reported his herds had grown to 12,000 head. In 1893, he formed the Big Horn Sheep Company, with himself holding half the stock and his mother the other half. Also in 1893, Okie bought the Smith Mercantile in Casper, Wyo. His brother Fred came from the East to run the store. In 1895, to accommodate the large number of his employees who lived near his cabin, Okie opened another store near Badwater Creek. The store made the place seem like a town, because so many people were coming and going. According to the legend, in 1864, during the Indian Wars, seven Swedish miners discovered gold near the headwaters of Badwater Creek. Before the miners could reach any town or fort with their treasure, Indians killed five of them. The remaining two miners managed to get to Fort Laramie. By that time, one was thought to have gone crazy, but the other supposedly handed $7,000 worth of gold dust to the fort’s sutler for safekeeping. More men went back to the mountains to find the mine, taking the sane miner with them. But Indians killed him, too, and the mine was never found again. 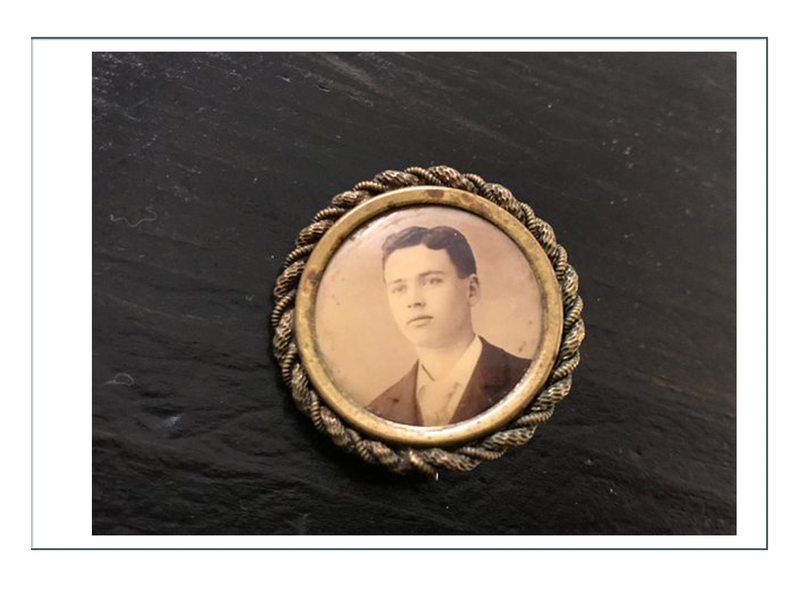 Meanwhile in Casper in the 1890s, Okie’s brother Fred, who may have chafed at working for his brother, caught gold fever, quit running the store in 1897 and went to prospect on Casper Mountain. Okie, who was too practical to pin his hopes on something as risky as a gold mine, closed the Casper store and moved all the goods to Lost Cabin. Within a few more years, he opened stores in several hamlets around central Wyoming—Lysite, Arminto, Moneta, Shoshoni and Kaycee. In these stores, without having to make the days-long trip to bigger towns, ranchers, cowboys and sheepmen could buy the tack and tools they needed to get from one season to the next. Prices might have been high, but saving the long trip was worth it. 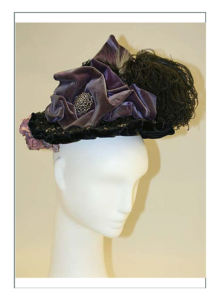 The men’s wives could buy a sewing machine and fabric to make clothes and curtains for the family, patent medicines for their ailments, and stylish, ready-made hats and dresses for themselves. Knowing his business depended on the good will of his customers, Okie cheerfully gave them credit. They could buy now and pay later when they had money—after shearing time or after lamb-shipping time. This practice worked so well that Okie began lending money for other purposes. Before long, it seemed as if everyone in central Wyoming either worked for J.B. Okie, shopped at his stores, borrowed his money or did all three. “All the little sheepmen here have the blues,” Percy Shallenberger, a clerk in Okie’s Lost Cabin store, wrote to a friend in Casper in 1901. “They can’t make anything. They are all paying Okie 12% interest on their money and 75% profit on their goods.” The interest rate Okie charged was low for the time, when rates of 18 to 24 percent were common, and rates of 40 percent were not unknown. Even so, as Shallenberger’s letter indicates, Okie controlled his customers’ financial lives. Still, they seemed to like him. They told a good story of his fearlessly confronting a thug just about to leave the store without paying. They told another of his public scolding of a clerk, who was about to cut off credit to a loyal customer. Okie hired smart people, paid them well, and then got out of their way when there was work to do. They worked hard for him in return. Okie was determined to make Lost Cabin an important place. In the 1890s, he paid for a schoolhouse and donated it to the school district. He opened a coal mine in the hills to serve the town and built a sawmill to provide lumber for residents. Eventually, he built a diesel-fueled power plant to generate electricity and created water and sewer systems. In 1906, he imported a Great Smith, the first car in central Wyoming according to the Natrona County Tribune. It was shipped to Lost Cabin by rail and freight wagon. Soon he put employees to work improving the roads nearby. Okie’s “Big Teepee” at Lost Cabin, shown here about 1906, got its name from Shoshone Indians traveling to and from the Bighorn Mountains. American Heritage Center photo. In 1901, his mansion was finished. It’s built of wood and local stone, and its materials and the handsome lines of its roof and windows suggest the architect was familiar with the work of both Frank Lloyd Wright and the more conservative Henry Hobson Richardson. It has two stories and sixteen rooms, a veranda on three sides, and an octagonal, third-storey tower at the front corner. Before the cottonwoods around it were as big as they are now, Okie could survey his empire in all directions from the windowed room at the top. Shoshone Indians, who came by frequently on their way from the reservation to the mountains, supposedly called the mansion the “Big Teepee.” The name stuck. Okie continued raising sheep. With the money he accumulated from other ventures, he could afford to buy sheep when others sold and prices were low. When prices rose again, he sold his livestock and made good profits. Similarly, he built large wool-storage sheds. They allowed him to store his wool when prices were low and sell when prices rose. When he lent men money, they put up their sheep as collateral. If they couldn’t pay their debts, as sometimes happened, Okie acquired their herds. Each spring, however, he had to send half his profits to his mother. Okie wanted to invest this money in new prospects: purchasing more sheep, increasing the size of the wool storage sheds, improving the shearing sheds, acquiring more land. In 1898, he persuaded his mother to sell her remaining interest in the company to him for $30,000. After this deal was made, he could plow all the money he liked back into the company. The new investments paid off quickly. Business boomed. But Okie’s plan backfired. Convinced he’d cheated her, his mother sued him in a court back east just as the mansion was finished, in the fall of 1901. She claimed the $30,000 he paid her was far too low and that he took advantage of her ignorance when he offered to buy her interest. 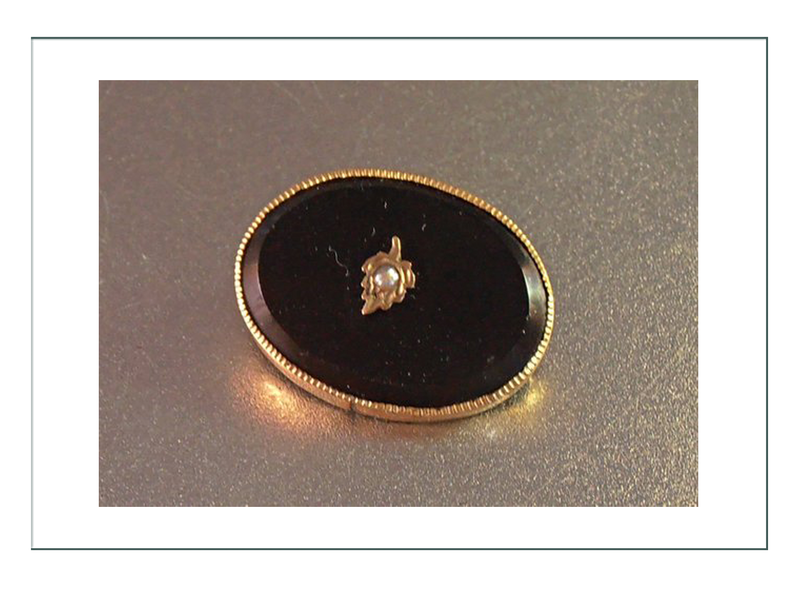 Okie claimed he’d tried to teach her about the business for many years and urged her to reinvest her annual profits in the company, which she was reluctant to do. The court found his arguments more convincing, and ruled in Okie’s favor. But both Okie and his mother, their legal maneuverings made clear, were business sharks. Okie and his wife, Jeannette, came into conflict with each other at about the same time. During their marriage, they traveled widely: to both coasts, to Yellowstone, to Mexico and to Europe. But they began drifting apart. Jeannette, suffering from lung ailments, started spending winters in Washington, D.C. with Okie’s mother, taking some of their children with her. It was at this time, in 1902, that their four-year-old son, Paul, died of diphtheria in Lost Cabin. 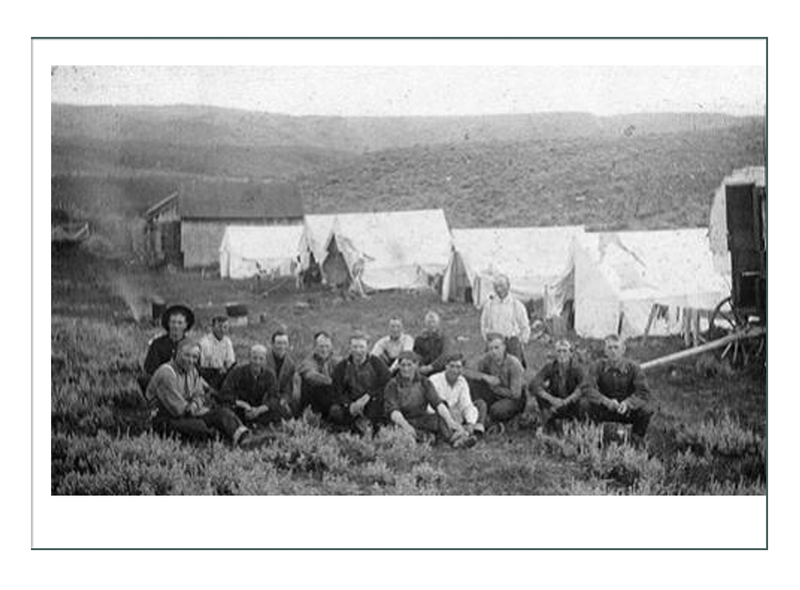 Sheepherders at a camp on Nowood Creek, north of Lost Cabin, 1916. 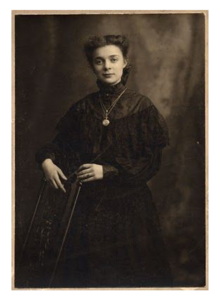 Wyoming Tales and Trails.Also around this time, Clarice Lovett arrived in central Wyoming with her husband, Herbert, who came to Lander, Wyo. to manage the telephone company. She was young and well educated and, in Okie’s view, a much more sophisticated woman than Jeannette. Lander’s Wind River Mountaineer said she was the most beautiful woman in Wyoming. In 1907, Okie and Jeannette divorced. Clarice obtained a divorce from Herbert, and she married Okie the next day. He took her on a trip around the world. They built a number of guesthouses near the mansion and added the aviary. At night, after dinner, they read novels aloud to each other in French. But if there was conflict in Okie’s family, there was real violence on the range. Sheep populations grew fast in the 1890s while cattle herds declined, and cattlemen watched sheep overrun the ranges they were used to controlling. Under the law, any unowned or unclaimed range was open to anyone who wanted to use it. But by custom, the stock raisers who came into the country first had first dibs. In most places, that meant cattlemen. Cattlemen, whose herds had grazed legally on the open ranges for many years, came into conflict with sheep raisers when the sheepmen brought in their flocks. Conflict was especially violent in the Bighorn Basin, not far north of Lost Cabin. Cattlemen resorted first to threats—publicizing theoretical lines across the range that sheep were not to cross. When sheepmen crossed these deadlines, cattlemen carried out their threats. Entire flocks were slaughtered and the carcasses burned. Sheep dogs were shot. From time to time, men were murdered, and no one was charged with the crimes. There were no more killings after the Spring Creek Raid in1909, when three sheepmen were murdered. Five cattelemen were convicted of the crime, but raids on sheep camps continued until 1916. Okie avoided the violence of those years because he had arrived in the country as early as or earlier than most of the cattlemen, was well known and influential, held water rights on a vast amount of grazing land, and respected the deadlines. But he still had trouble with the law. In 1910, the U.S. Department of the Interior sent a special agent to Wyoming to investigate a complaint of false entry made against Okie. The practice, while fraudulent, was not uncommon. To enlarge their holdings, landowners in the West often persuaded friends or paid employees to “enter”—file claims on—federal land on behalf of the landowners under the Pre-emption Act, Homestead Act, Desert Land Act, Timber and Stone Act and others. The big bunkhouse at Lost Cabin was built in 1916.The different laws allowed acquisition of different amounts of land, generally 160 to 640 acres; specified different amounts of time generally between three and seven years, between filing the initial application and proving that all the requirements had been met; and required small payments when filing and larger payments when “proving up,” as the final process was called. The Homestead Act, for example, required no fees; the land was free if a person or family could survive five years on it and make the required improvements. The laws also specified, however, that these claims were meant to be one to a customer: Under the law, a person could only file one homestead claim, one desert land claim, etc. Even by working with all the available laws, a person could only accumulate around 1,120 acres, which was not nearly enough for a stock raiser to make a living in country where a single steer might need 40 acres to thrive. Therefore, stockmen often paid or otherwise persuaded their employees to enter land on the stockmen’s behalf. Many, if not most, ranches of any size in Wyoming and the West were assembled this way. But agreement ahead of time between two people that the second would claim the land and, after proof, give or sell it to the first person who proposed the arrangement and who wanted the land in the first place, amounted to collusion to defraud the government. And it was nearly impossible to prove. At the same time the requirements for proof at prove-up time were lax. A claimant only had to send in papers with affidavits signed by witnesses that stated he followed all the rules and made the required improvements on the claim. The U.S. General Land Office had nowhere near the staff necessary to check on the validity of all these documents, and so fraud and perjury became common there, as well. In 1916, probably hoping to make an example of so prominent a man, the government sued Okie for land fraud. If he lost, he would owe back rent on the13,500 acres the government claimed he obtained illegally. The value of that rent was about $85,000—enough to ruin him. Headquarters of Okie’s sheep and retail businesses in Lost Cabin, built about 1918.The case dragged on for nine years. The government lawyers had a hard time proving any collusion, before the initial entries, between Okie and the entrymen. But after many depositions were given by both sides, five of Okie’s entries under the Timber and Stone Act showed evidence of fraud. Finally, however, the judge threw out all the charges, partly because, he said, the government’s lawyers moved too slowly from the time the fraud was supposedly discovered in 1910 to the time they brought the case in 1916. Okie emerged with his 57,000-acre empire intact. Meanwhile, the railroad bypassed Lost Cabin in 1914, and instead went through Lysite, three miles away. This was a blow to the town, and especially to the business volume at Okie’s store in Lost Cabin, which he finally closed about 1917. Even so, Okie still kept expanding his holdings. 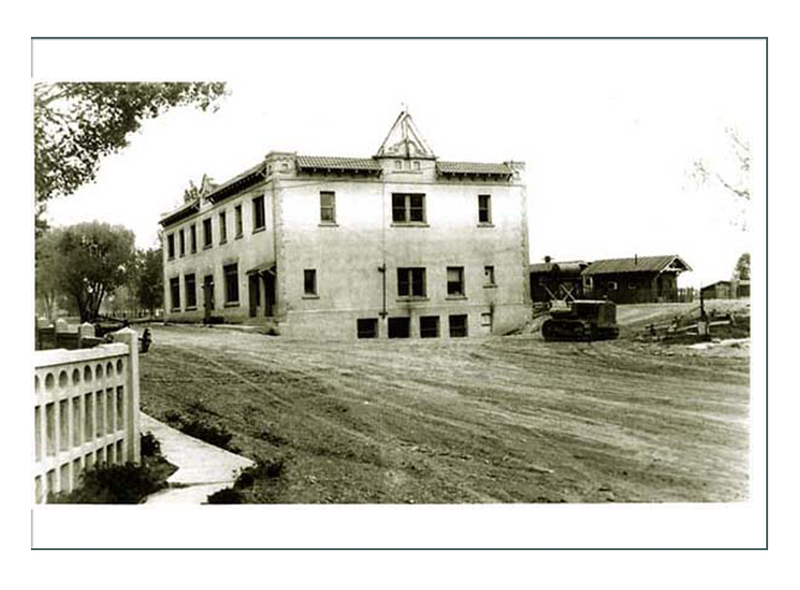 In 1916, he had a huge bunkhouse built for his employees, followed by construction of a golf course in 1917, stylish bungalows for his guests in 1918 and a big new office building, from which he ran the rest of his stores, about the same time. Okie turned management of the stores over to his second-oldest son, Howard, in 1919. That same year, severe drought caused many sheepmen to sell their herds and leave the business. Rather than lose his own sheep or watch them die under such conditions, Okie took a risk and shipped 30,000 head to the state of Sonora in northern Mexico. This plan didn’t work as he hoped. The grass was poor and theft was common. He eventually sold most of the sheep at a severe financial loss. While still in Mexico, however, he bought the Piggly Wiggly franchise for Mexico—Piggly Wiggly was the fast-growing self-service grocery-store chain—and opened six stores. These did well, and the profits he made on that investment offset the money he lost on the sheep. In Wyoming, however, Lost Cabin was continuing to decline and Okie’s interest in business was declining with it. His personal life darkened over the next decade as well. 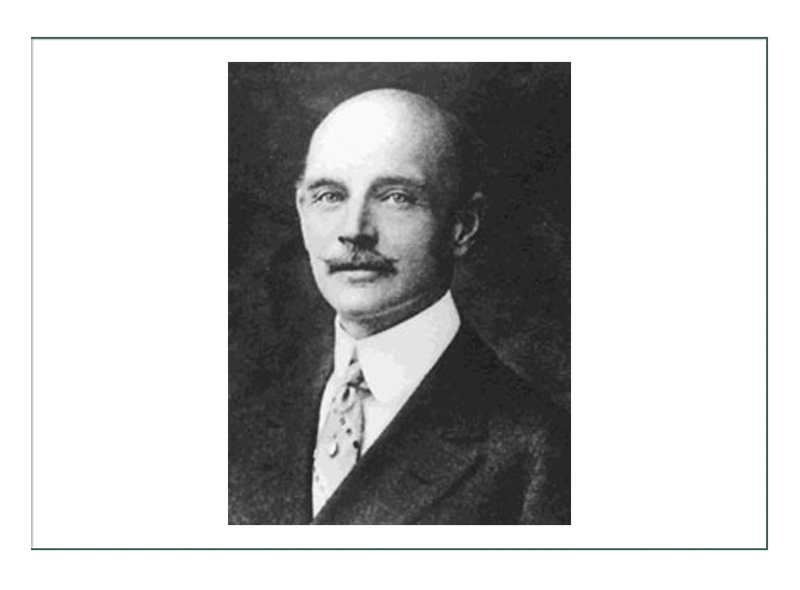 Howard died of the flu in 1919, a victim of the pandemic that killed millions around the globe. In 1921, Okie and Clarice divorced; supposedly she paid too much attention to a younger man at a party, and Okie’s pride was offended. When she proposed a reconciliation, he refused. He was 56 years old. He continued traveling. In Mexico, he may have married again. One document in the Wyoming State Archives names six Okie children by three different Mexican women, though it’s unclear how many of these he married. Still, he seems to have felt most comfortable with his old friends in Lost Cabin, and considered it his home. His businesses appear to have survived the great stock market crash of 1929 reasonably well. But, though none of his friends years later would admit he was depressed, they did remember he was drinking more than usual. One afternoon in November 1930, Okie went duck hunting with his friend and general manager, R.P. Pruitt. Apparently Okie slipped on the steep, muddy bank of the small reservoir near Lost Cabin. The water was 40 feet deep, he was wearing heavy clothes, he was unable to swim and he was out of Pruitt’s sight. He sank, and drowned. Townspeople finally had to drain the reservoir to find the body. Venice Beske photo.Though smaller, Lost Cabin in its heyday was as much a company town as Hanna, Wyo. with its coal or Midwest, Wyo. with its oil wells. But unlike the others, Lost Cabin was very much the product of one man’s personality. The mansion belongs to ConocoPhillips, an oil and gas giant. The dry hills around Lost Cabin bristle now with natural-gas wells, some more than five miles deep, and gas-sweetening plants. The gas comes out of the ground mixed with poisonous hydrogen sulfide, which must be removed at the plants so pure methane gas can be piped to market. But few people live there. Employees who work at the plants commute 35 miles from Shoshoni, and places farther away. J.B. Okie’s personality survives in the Big Teepee. It’s well kept, freshly painted, and part of the lawn inside the old cast-concrete fence is kept neatly mown. It looks as if the oil and gas company expects him to return any moment, for a party with his family and his employees, talking and talking about all his bright ideas. There is a slight discrepancy in that no one significant in Okie’s life died during the time Judy would have been there. We will just have to assume they did in that day and age in the Wild West. We think the wife would have taken Judy with her at the 1907 divorce, so the rest of this story is just for interest as we’d rather follow her.! The main thing is, by 1907, Victorian rituals for mourning were fading, and in the next few years, so would the uniforming of domestics. Our character therefore lived in a type of “Camelot” from 1901-1907 where maids were a part of a happy and prosperous family. Choose a couple pictures of maids in mourning and replicate them. 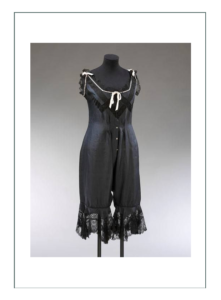 As an older woman, she would need to decide to keep her comfy and favorite symmetrical Late Victorian corset, or go with the new “S Monobosum” of the Edwardians. We think she would wear both, so the design of the skirt and blousewaist can accommodate either. Since her fictional family will take her places with them, and have some wealth, she will be the latest style in public with them, but wear her comfy corset in private. 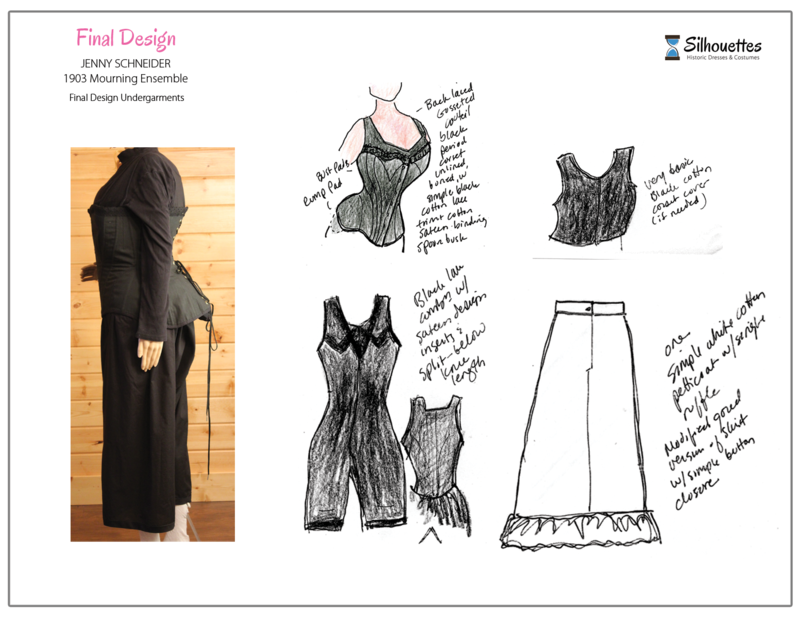 We will build her a sedate combination with a plain and simple corset cover to match. The petticoat will be very plain, simple, and adjustable too. Comfort is key when you’re a working woman! 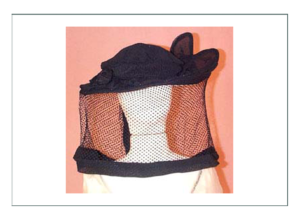 We like these, as we would like to elevate the character to the Head of Housemaid or a personal ladie’s maid. 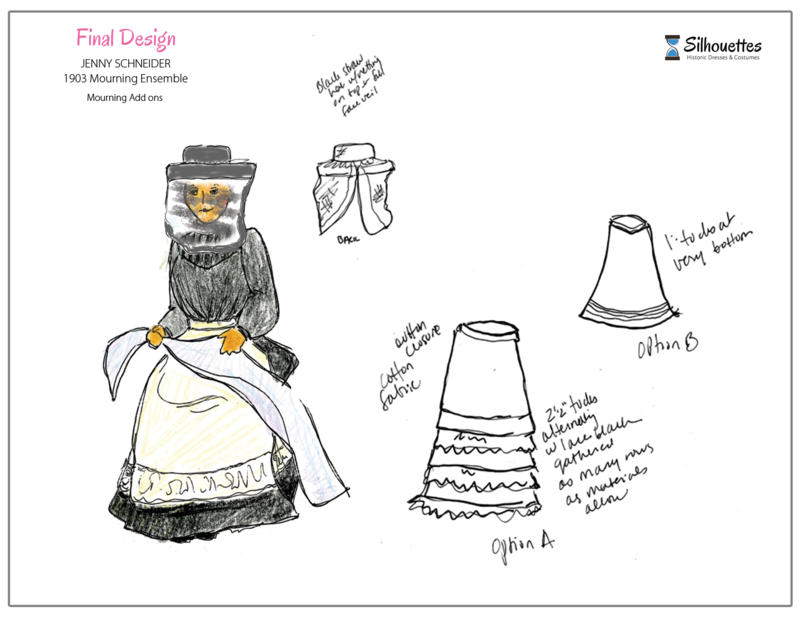 She can get away with a half apron, we think, but the Cap needs to be consistent with the smaller ones shown here. If possible, we would like to just build this (adding a cap) – hair and attitude and all! 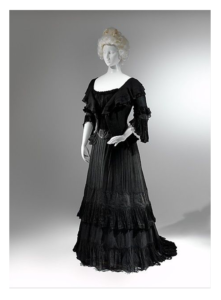 Black taffeta silk, black cotton, black lace, and white cotton for apron and cap. That’s it. No photo needed of all black.